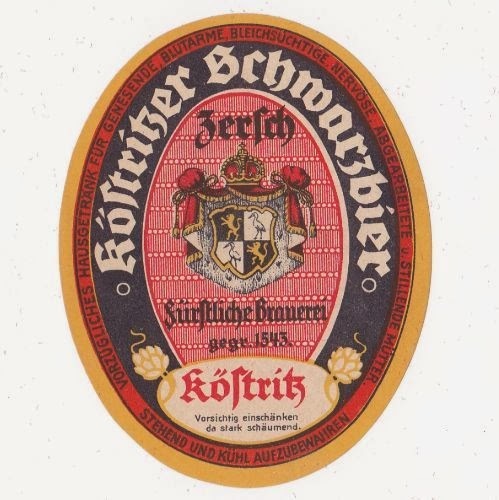 The history of this style is closely bound to the brewery of Köstritz. Located in the village Köstritz (later Bad Köstritz) in Thuringia in the valley of the river Elster. Near to the town Gera (10 km) and not too far from Jena (40 km). 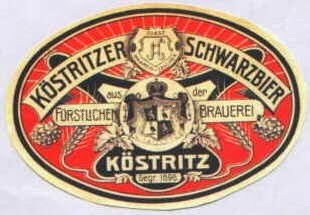 The beer from Köstritz was well known in the surrounding towns (later also in Berlin and Leipzig) since centuries. The brewery was primarily brewing for export comparable with breweries in Einbeck, Torgau etc. Like most export breweries, they produced stonger beer than local breweries in order to make them durable for transport but also meeting the demand for stronger beer (most local brews can be expected as pretty low in alcohol). So they offered a luxury good. when they digged a cellar / lagering cave ("Höhler") back in 1691 and starting to offer "cave-beer" ("Höhlerbier") probably aiming to produce a high quality luxury-good that would yield good prices. It must be assumed that they used top fermenting yeast but there is no evidence. Surely they made an early form of "Lagerbier", especially for the region. It is said that they used the cave to store the beer from autumn to spring in order to kick of a well lagered beer in the hot months. End of the 18th century is when it became real fun. 1784. Englisch Bier, die Bouteille 10gr. 1794. Auf dem Ratskeller: Köstritzer Höhlerbier die steinerne Bout. 2. gr. 3. pf., doppelt oder englisch Köstritzer in gläsernen Maasbouteillen 3 gr. 6 pf. 1900. Auf dem Ratskeller: Breyhan; Bamberger Bier in steinernen Bout. à 4 gr. ; Köstritzer Höhler pr. Bout. 2 gr. 6 pf., Köstritzer Englisch in Glasbouteillen à 4 gr. (für die Bout. außerdem 3 gr. Einsaz). 1812. Köstritzer Englisch Bier in Glasbouteillen à 4 gr. 1816. Bourton-Ale die Bouteille 14 gr. 1821. Einfach Bier die Kanne 1 gr. 2 pf. Weizenbier die Kanne 1 gr. 8 pf. The "englisch Bier" (english beer) takes the place of the earlier "doppelbier" (double beer) from Köstritz. As there was kind of a hype for english beers early in the 19th century this is not quite shocking, but the most known printed recipes are published after 1794.
there was some discussion on the same topic. English beer was imported (even more to Bremen, Berlin and Hamburg than to Gotha). There was porter and ale (or like the germans called it "oel" or "öl" which means oil). supposedly the guys in Köstritz simply tried to remake those imported beers as they edged into their premium market. The Brewmaster Johann Philipp Christian Muntz reports in his books about brewing in Köstritz (1811-1832). He does mention "Englisch Bier" but there is no exact recipe. He gives grand attention to precise malting and kilning and reports to use one or two types of malt per beer. No black malt of cause but highly kilned malt (like todays munich). He used a kiln with smoke-separation and wedge wire floors. For strong beer like english he uses two kinds of the best quality hops from germany (those from Spalt are the strongest he notes). All work was done manually with workers carrying around tubs with wort e.g. in the cellar where they did fermentation and lagering year-round. Like other documents of the time he uses the term "Englisch Bier" like a synonym for strong beer. Seems like english "Ale" and "Porter" was the "Bock" of the north before the bavarian beers became dominant in the 19th century. It is not clear to me if they tried to copy more Ale or Porter. probably this beer was dark brown, stronger than usual beer maybe 5% abv or more. and well hopped. In the 1830-40s the köstritzer brewery had reportedly at least 3 types of beer with 8,3% 6,8% and 2,4%vol. 1874 Carl Holomoucky a brewmaster from Bohemia was engaged in Köstritz. 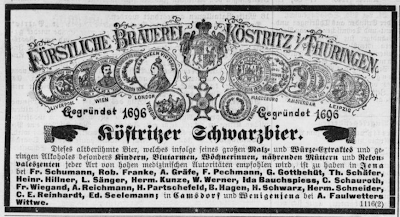 1878 they offered: a pale lager beer, a bavarian (dark) lager beer and "Schwarzbier" probably also (bottom fermented) lager beer. But there are differing accounts on bottom or top fermenting. 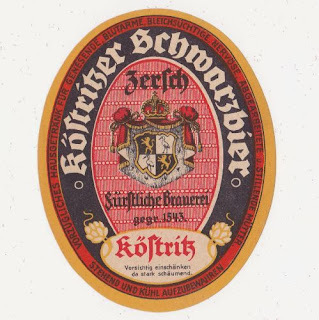 first known Schwarzbier label around 1900? They had to face growing competition from newly founded industrial breweries which produced lagers with the bavarian method as well as bavarian beer that was imported via the new railroads. So they invested in marketing and crazy made-up names. I claim that "Schwarzbier" had not much to do with "Englisch Bier". 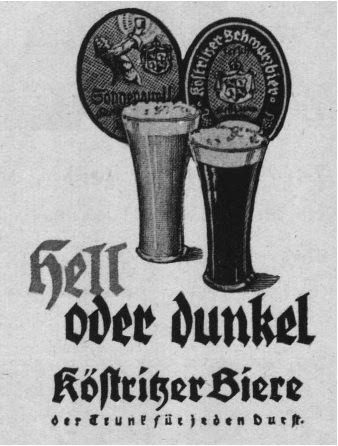 1893 they produced 20.000 hl, half of that was Schwarzbier (top seller). Their premium product of the time was the bavarian-style dark lager. 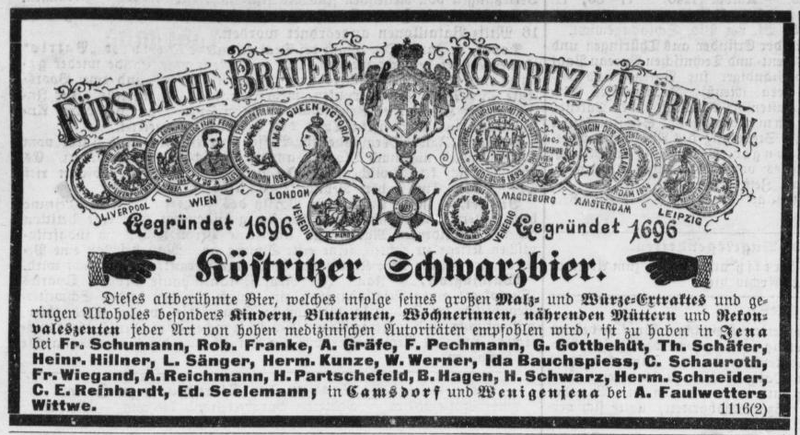 probably in the 1880s they began to advertise "Schwarzbier" as an healthy "Hausgetränk für blutarme und stillende Mütter" (house-drink for anaemics and breastfeeding mothers). The "reine hopfenreiches Malzbier" (malt-beer pure and rich in hops) had in 1890 around 3,5%vol in alcohol. It was probably very sweet but bitter (SG 14°P FG 7°P). Being low in alcohol became a positive selling point for a medical beer. As the technique of roasting malt (in a drum roaster) for coloring was known in the time, I suppose they used black malt to gain a black color. Zimmerman offers in his book from 19842 a recipe for "Braunbier" (ordinary brown topfermented beer) as well as a porter recipe both with roasted malt. They used to produce their own color malts so I don't know if it was of strong rost-bitter flavor. Maybe they tried to reduce harsh burnt flavors by roasting mildly or by roasting huskless grains like wheat but I am pretty sure there must have been much more roasty flavor compared to todays Schwarzbier. How would it have tasted compared with todays Köstritzer?